At last: a ray of sunshine pierces the otherwise drab CGI movie clouds that have been looming over the horizon recently. 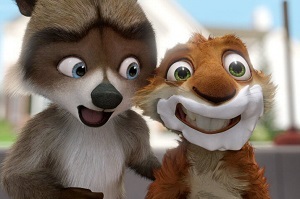 Over the Hedge successfully balances cute wuvvable characters with a involving narrative, decent subplot and some genuine laughs. It’s everything SO many other CGI movies should be. It’s not brilliant, sure… and probably steals more than a bit from the groundbreaking Toy Story, but it certainly makes up for the previous meagre efforts of Dreamworks Animation (such as Madagascar) and its rival Pixar (with the recent Cars). In a similar vein to Toy Story, the day to day lives of a group of animals lead by the sensible tortoise Verne (Garry Shandling) are interrupted by the arrival of the savvy RJ (Bruce Willis), who very soon lures their attention to himself and the wonders of the human world beyond the ‘endless’ hedge. The dynamics between the varied characters are wonderful, from the father possum teaching his daughter how to play dead to the irrepressibly energetic squirrel Hammy (voiced almost unrecognisably by Steve Carell of The 40 Year Old Virgin fame). The success of this film over the other more recent depressing efforts of the big animation studios could be that it’s based on a syndicated comic strip, though I doubt the original had quite the family-oriented focus about it. The animation is a perfect balance of detail and simplification, realism and exaggeration, and most importantly you can feel for these characters. Who wouldn’t get a little teary when a tortoise mimics the human expression of betrayal? The running time is clearly a bonus also, with the recent Pixar films getting longer and longer. These are KIDS films, and it seems that studios have forgotten this in the rush to simultaneously appeal to the adult market. The soundtrack is teeming with selections from Ben Folds, and is very hokey, though ‘Rockin’ the Suburbs’ is admittedly rather relevant. Over the Hedge is a good quick dose of quality entertainment, and there’s certainly more than enough humour to entertain those over the age of 12. A couple of moments towards the end probably get a little too complex for young kids, but there’s enough going on to maintain their attention. See it instead of Cars.